SETTING THE INTERNATIONAL STANDARD FOR PROFESSIONAL ENGLISH SERVICES. 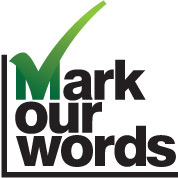 At Mark Our Words, we provide one of the most reliable and sophisticated online English proofreading, editing and teaching services. All while keeping costs at a minimum. A TEAM OF ACADEMICS DEDICATED TO ENSURING THAT YOU ACHIEVE YOUR VERY BEST IN ENGLISH. Offering professional and expert services to students at high schools and universities studying around the world, Mark Our Words will ensure that your writing skills will be improved as we carefully correct, comment and comprehensively evaluate your abilities in written English. COMMITTED TO PROVIDING YOU SERVICES OF THE HIGHEST CALIBRE AT THE MOST AFFORDABLE PRICES. We will help you reach the highest standards of English writing from only $4.95 per page. See our pricing and samples page for more! WE PRIDE OURSELVES IN ENSURING THAT WHAT GETS SUBMITTED TO US GETS RETURNED TO YOU AT THE HIGHEST STANDARD. Register now to access our services.. Simply click the SIGN UP button! I submitted a college level paper on Australian literature and was quite amazed at your ability to correct the grammar and sentence structure of my paper, even when I thought I got most of my writing perfect. Did not come to my mind the extent to which my paper had to be changed in terms of sentence structure and vocab. Thanks for all the help. with low cost, mark our words had improved my English writing skills and assist me in getting better marks for my essays and assignments. Liked all the suggestions and ideas given. for non-native speakers of english, i would recommend mark our words to others. you guys were fast and all the comments that you gave on my essay were all very helpful. Little skeptical at first... but proved me wrong in the end. Great job improving the sentence structures and appreciate the valuable feedback. Being ESL background, I often cannot properly phrase and express my ideas the way that I want. By having my essays corrected at Mark Our Words, they are able to fix up what I say and even provide further suggestions to how I should convey my ideas. Thank you!!!! For the low cost that I had to pay, it was definately worth the increase in not only my grades, but also my English ability as a whole. Mark Our Words shows that you don't have to spend much to learn much. Great sophisticated level of services at Mark Our Words. Despite the content of my paper being quite difficult, you were still able to competently scrutinise and comment on the style of my writing and suggest various changes that I had clearly not forseen. Keep up the good work. Back to school promo ending soon! Our February promotion is running out soon! Get those submissions in quick for your 250 words of editing free!! Our February back to school promo is up and running! All submissions this month receive the first 250 words free! Click the heading to find out more!